I read to my kids a lot when they were tiny. They grew up hearing lots of stories, from BEAR SNORES ON to THE FELLOWSHIP OF THE RING. It was easy with my girls. They never got to the point where they would squirm away from me when I was reading to them. Not so with my boy. When he was two, he was always going, going, going. Suddenly, he didn't have time for snuggly reading time nonsense! So one day, I forced the issue. I grabbed our copy of THE MONSTER AT THE END OF THIS BOOK and made him sit with me as I read it (he tried to squirm away at first, but I simply said no and kept reading). I read with emotion. I did all the voices! And by the time I got the the end of the book, my little guy insisted that I read it again. And again. Every child is different. But every child deserves (needs!) to be read to, whether they seem to be interested or not. 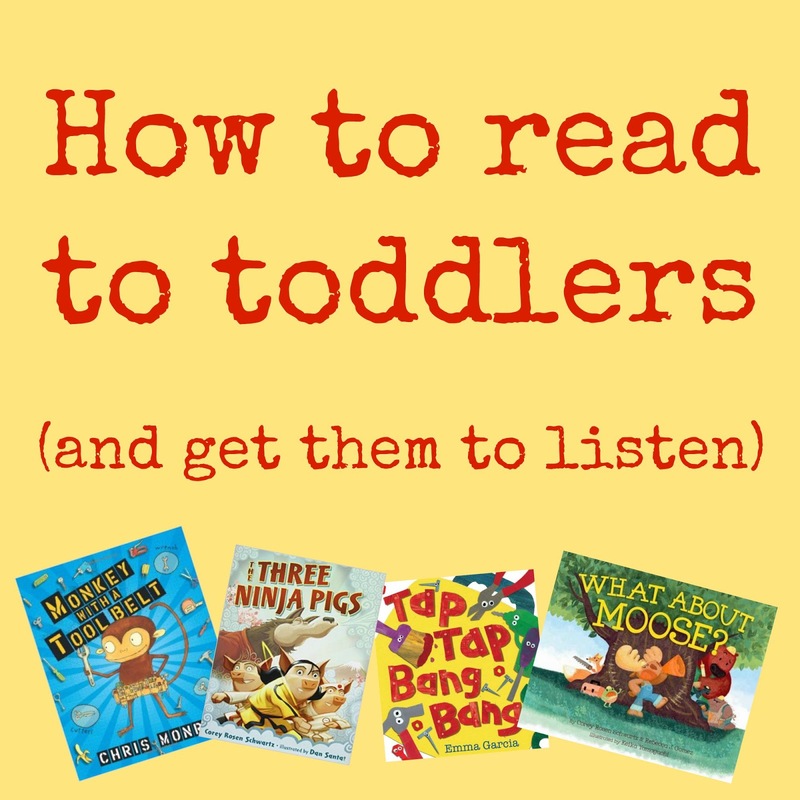 So here are a few ideas on how to read to your toddler, even when they don't seem to be interested. Match books to their personality. One of the reasons THE MONSTER AT THE END OF THIS BOOK worked for my son was because it is full of action and humor, and the interactive nature of the book kept his attention. If you sound bored when you're reading, why should your child be excited? Make faces, do the actions, roar the terrible roars along with the wild things! It will make reading to your child that much more fun and memorable. Read to a captive audience. When your child is playing quietly with a set of blocks or dolls, pick up a book and read to them as they play. They may continue playing and seem to ignore you. Or they may decide to come and curl up on your lap. Either way, the story will be working its magic! This is perfect for those sick days too (haha, sneaky!). Make it part of the bedtime routine. This is a classic, of course. Sometimes kids will want you to read to them just so they can stall sleepy-time. There's nothing wrong with that! It allows for more bonding time between you and your kiddo! Let your child choose their own books. Sometimes my son wanted me to read a book about Scooby Doo or Spongebob. They were not my first choices for quality literature. But if they kept my son interested in reading with me, then what could it hurt? A child will be more receptive to hearing a story they chose themselves. Read while on the road. Road trips are a challenge with toddlers! These days it's easy for a lot of people to pop in a DVD. But take advantage of the times when your kids are calm and read a favorite picture book or two. When my girls were tiny, this was a good way to distract them if they started getting fidgety on the way to Grandma's house. Make a trip the library an event, not just an errand. Help them associate books and reading with fun. Pair the outing with a picnic at the park, a visit to a playground, or a stop to get an ice cream cone or slushy. Lift the flaps. Finger puppets. Touch and feel books. These are all great ways to engage the senses and get your tot interested in books! The most important thing to remember when reading with your toddler is to make it a fun, special time with your child. Even if your kiddo loses interest in a book half way through and scrambles out of your lap, you are still making connections. And if you keep it up, you'll continue to make those connections throughout your child's life! 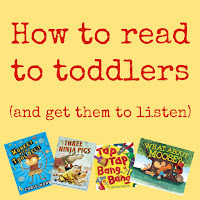 Do you have any ideas on reading to toddlers?